As I stated back in November of last year, I would do a couple of more of this series of people in my family album before I leave this blog. I went through one of the family albums this past Saturday to decide who to make blog entry about in this series. I decided on a man who was a first-cousin of my grandpa's (maternal). He was a sheriff in a county in north Mississippi back in the late 1930s. 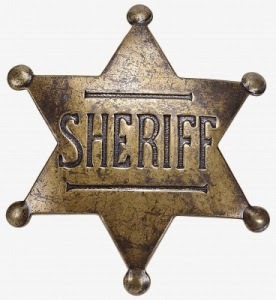 His name was Robert Collins or Sheriff Collins as he was called back in those days. I prefer not to name the county due to a number of reasons I am not going to go into right now. Sheriff Collins was a well thought of man throughout the county due to his kindness and humane treatment of prisoners (which was not very common back in those days, especially the South). He would frequently take a sick baby and its mother to the county doctor when they had no other way to go. My grandpa's cousin was greatly respected, even by those he arrested and placed in county lockup. A man who was arrested for stealing food from the general store was given the opportunity to pay it back by doing odd jobs that needed being done around the jail. That way he could still provide for his family. Sheriff Collins was always reelected with never having any opposition for 14 years as sheriff. Sheriff Collins was a devoted family man and a deacon at his church. Sheriff Collins had only one full-time deputy and two -part-time deputies who were called up in case of emergency. I know, he sounds a lot like Andy Griffith in Mayberry. Unfortunately, the county he lived in had only one bad problem; moonshiners trying to run their product over to Louisiana. Lots of people died from lead poisoning from moonshine back in those days. My grandpa's cousin did not "cotton" to moonshiners. That means he had no patience with them. If he caught them, they were going straight to jail to await the "feds" to pick them up. One night Sheriff Collins got a knock on the door. It was from a farmer who said he had passed a car on a nearby dirt road who had driven into a ditch. He said he thought they were moonshiners judging from the smell. Sheriff Collins usually would take his deputy with him when he encountered moonshiners. But, it was about 1 or 2AM. He didn't want to wake up his deputy. So, Sheriff Collins went out to investigate on his own. When he got there, he knew right away they were moonshiners who were about to take off. But, he blocked their path. Apparently, when Sheriff Collins got out of his car, he was greeted with a blast from a shotgun. Sheriff Collins was killed instantly judging from reports of the day. The moonshiners were caught in Bogalusa, Lousiana by police. One of the moonshiners had Sheriff Collins pistol on him, thereby sealing the fate of both men. They both were hung less than six months later. Sheriff Collins had a huge funeral procession and lawmen from all over the south came to attend according to a news clipping attached to his picture in the album. Some questioned Sheriff Collins for getting out of his car with men he didn't know. There had never been a killing of law enforcement in the recorded history of this county. I guess the sheriff just thought the men would lay down their arms and surrender peacefully. But, these men were from Texas, and not from the county he patrolled. Of course, there was no way for Sheriff Collins to know that. Just looking at his picture, he was a big man. But, from everything I had ever heard about the man, he was a gentle giant who just wanted to help people as best he could.